Need some help getting around Inspire Planner? Let us help you become more familiar with the Inspire Planner interface so you can easily navigate within your project and make full use of the different tools that are available to you. First, let's familiarize ourselves with the different areas of the Inspire Planner Interface. The Project Name can be found on the upper left-hand corner of the page. The Project Toolbar is the set of icons to the left. 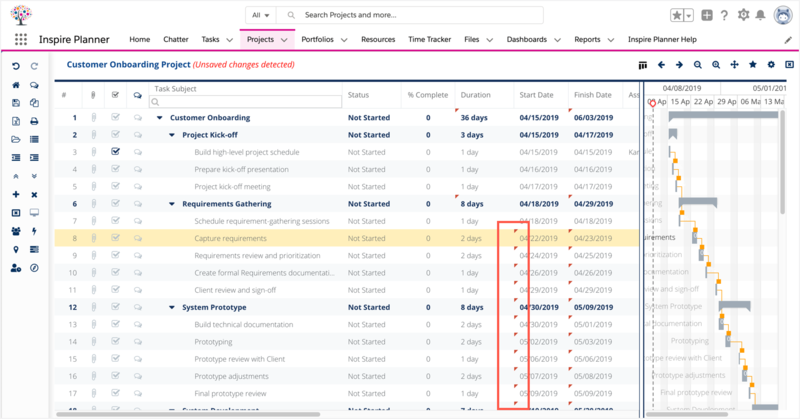 The Gantt Toolbar is on the upper right-hand corner of the page. See image below. The Project Toolbar is the set of icons to the left. Each icon performs a specific action on the project plan. Unsure of what the icons do? Hover over each icon to see a brief description. See below for more information. The Gantt Toolbar is the set of icons at the top right corner. Each icon performs a specific action on the Gantt Chart. These set of icons relate to your Task List. You are able to undo or redo changes you perform to your project tasks by using the Undo Action and Redo Action icons. However, it is important to note that you can only undo and redo changes that have not been saved. Once you save your changes, you can no longer undo or redo them. There are certain changes related to tasks that cannot be undone such as a file upload, a chatter post, adding collaborators to a project, and task assignments. Whenever you make a change to your project, a red indicator appears on the top left corner of the cell to indicate that there are unsaved changes. To learn more about the Task List, check out the Inspire Planner Help tab for How-To Guides, or submit a Help Ticket and the Inspire Support Team will get back to you.